For many of us, the holidays mean opening our homes to friends and family by hosting out of town guests, meals and soirees. In addition to lots of cooking and baking, we will also be making sure our floors and counter tops are sparkling right along with the lights on the tree. Here are six deep cleaning tasks often overlooked in the mad rush up to the holidays that will truly make your festivities clean and bright! Cleaning always starts with dusting and from the highest surfaces so that the dust knocked down is removed when floors are cleaned as the last step. Having an extension duster with a bendable head that can be set parallel to the ceiling fan blades works wonders. If the fan is easily reachable, an old sock over your hand lightly spritzed with a dusting agent allows you a more thorough cleaning as your hand can adjust to the shape of the blade or light fixture. Extension dusters work best on light fixtures as well- don’t forget about the mounting hardware above the light itself or the inside or recessed lighting where cobwebs like to hide. A vacuum wand with a bristle brush attachment tends to work best on vents to remove the dust that builds up on the slats along while removing cobwebs that can get nestled further inside. While you have the vacuum ready in this fashion, gently run the brush attachment over any fabric lampshades you have- chances are you will see a difference in color right after the first swipe of the vacuum wand! Take a duster to the top of moldings around door and window frames before moving on to the baseboards below. Depending on how long it has been since the baseboards were last cleaned, you may need to do a full wash to remove caked on dirt using a damp rag or a duster may also work if they are kept up on regularly. This can be a time-consuming task but it makes a world of a difference once they are clean. Scuff marks on white moldings often come clean by using a Mr. Clean Magic Eraser but be careful as these handy little pads can also take paint off if you use them too vigorously! Your fridge is likely to see a lot of attention over the holidays with delicious leftovers it will need to hold so now is a great time to clear out old food and make space. Take all of the items on any given shelf off, discard what is expired then wash and dry each shelf and drawer. Be sure to wipe down the interior sides and bottom of the fridge itself as well but be careful not to use any harsh chemicals- you don’t want the fumes or overspray mixing with food. A hot wash cloth can be set on tough, sticky spots if need be and should wipe clean after about 3-5 minutes. A damp colorfast rag usually does the trick to remove dirt and grim from light switches and surfaces surrounding door knobs but using a disinfectant wipe also can help eliminate cold and flu germs that run rampant this time of year. Other areas of entry doors usually can use a wipe down as well where people are likely to put their hands or feet when opening and closing it. Taking it one step further to wipe down the metal tracks under garage and front doors only makes them shine brighter! Carpet edges often are overlooked whether they be around a room or on the steps of a staircase. Using the edging tool on your vacuum will remove build-up which is especially true if you have pets. The few inches of floor under the overhang of cabinets is also neglected- wiping it down by hand is often the best approach for this area. 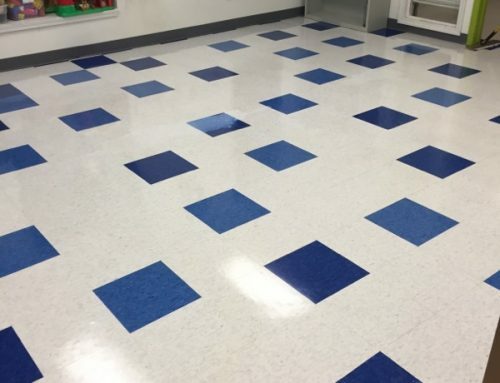 If your home has ceramic tile, having it turbo cleaned by a professional floor care company can significantly refresh the appearance of grout while removing dirt that has settled into crevices of textured tiles.